This is a bad time to be a coral reef. In the last couple of decades, rising water temperatures have caused massive “bleaching” events around the globe. That’s killed a large fraction of the world’s reefs. Today, though, marine biologists are looking at ways to give Mother Nature a hand -- in large part by making better coral. Corals are symbiotes. The coral animals, known as polyps, have colonies of algae living inside them. The algae are protected from predators, and, in return, they produce food for the polyps. When it gets too warm, though, the polyps kick out the algae. As a result, the corals turn completely white. Without the algae, the polyps can starve, so the coral dies. During a major bleaching event in 2016, for example, as much as a third of the corals on the Great Barrier Reef were killed or damaged. Scientists are investigating several ways to protect the reefs. One is to find species of coral that are more resistant to heat and breed them with species that need cooler waters. 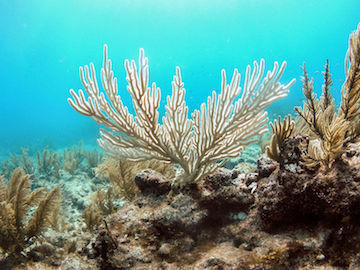 Another is to subject corals to temperatures that are high enough to almost kill them. The survivors may be more tolerant to stress, so they can be transplanted onto reefs that are in jeopardy. Researchers also are studying the algae that live inside the corals. They’re identifying species that like the heat, for example. And they’re looking at ways to “inject” the algae with bacteria that might make them stronger -- a sort of booster shot to help coral reefs survive in our warming oceans.